• There are 1,641 students at Swarthmore. They come from 48 states, plus the District of Columbia, Guam, Puerto Rico, the US Virgin Islands, and more than 75 countries. • The College is coeducational and has been since its founding in 1864. • There are more than 100 student-run organizations on campus. • The student-faculty ratio is 8:1. • 22 varsity intercollegiate teams compete at the Division III level. • The library has over one million volumes and is linked to the libraries at Bryn Mawr and Haverford for interlibrary loan. • All campus events are free to students. Swatties are an eclectic lot: smart, funny, and passionate about whatever they do, which is often different from what you might expect. Engineers go to Nepal to study philosophy. Philosophers edit chess magazines. Biology majors go on to medical school—and develop a sideline in photojournalism. They forge their own paths. You apply to Swarthmore because you love learning and you’re very good at it. What will surprise you, coming from high school, is that everybody here loves learning and is good at it. You will join a student body that recognizes the “inner light” and individuality of each person, an environment that values social responsibility, and an academic culture that provides limitless possibilities for learning. You will be part of a campus-wide atmosphere of respect for—and appreciation of—differences of background and opinion. On Friday night, you may stop by a party and dance for hours—or stay up late playing Scrabble and eating pizza with friends. Some of the best hours of your life will be spent sitting in the hall outside your room having conversations with your neighbors—conversations about anything and everything, from the lecture you heard earlier that day to your favorite movie quotes. The friends you make at Swarthmore come from all over the world—from Iowa to Ghana, from New York City to a small town in Oregon. They see you through hard times and throw you a surprise birthday party. Forty years from now, when your first-year roommate drops in from Paris or Poughkeepsie, it will seem like only days since you last talked. Academic life at Swarthmore is an alchemical mix of top-notch professors, brilliant students, excellent facilities, and an atmosphere with equal parts love of learning, collaboration, and mutual respect. Classes are tough, but you love them. Top grades aren’t the objective. You work hard because you want to, because there is nothing like knowing—really knowing—something you didn’t know before. You spend hours at dinner debating arcane points of philosophy and language. You fall on the floor laughing over biology jokes. Come junior year, you can choose to pursue your major in Swarthmore’s honors program. This experience features small groups of dedicated and accomplished students working closely with faculty, an emphasis on independent learning, and an examination at the end of two years of study by distinguished scholars from other colleges. All this will teach you more than you can imagine about the world around you, about the process of learning, and—most of all—about yourself. And it’s not just about the classroom; it’s about understanding that there are no limits to learning. 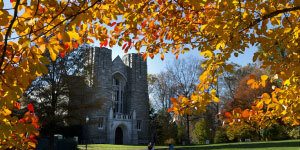 Swarthmore has the resources to allow you to pursue your many interests. Beyond generous financial aid with no required loans, there are grants for summer research and internships, funding for study abroad programs, and other means of support to help make your great ideas a reality. Don’t be fooled by the liberal arts label. If you’ve always wanted to be an engineer or scientist but aren’t willing to give up music, religion, theater, or political science, this is the place for you. Swarthmore students in the sciences and engineering win more than their fair share of National Science Foundation and other prestigious fellowships. 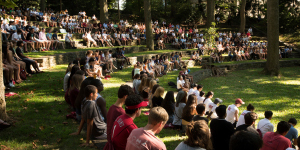 Swarthmore's student body includes about 40% domestic students of color—a critical mass of students who can engage in the dialogue of diversity without the feeling that it is their individual responsibility to represent their community. Both within and beyond the College’s different ethnic and cultural communities, there is a real sense of belonging on this campus. Outside of class, you will find places and groups of people that will nurture and support you. We strive to provide an environment where students can explore questions of social and cultural identity while fostering personal development and leadership skills, with a particular emphasis on social justice. Much of that exploration takes place at the myriad events we host that deal with race, class, gender, and sexuality. Whether it's a live Latino music performance, a South Asian movie night, a speaker series, or a lecture on cross-cultural collaboration among students of color, this is a place where students develop as scholars who are fully engaged in their communities. 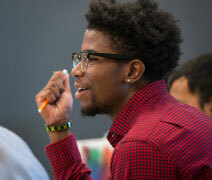 At Swarthmore, you’ll likely begin a lifelong habit of involving yourself in the larger world. Community building has been rooted in Swarthmore’s principles for more than 150 years, starting with its founding. Swarthmore’s forward-looking Quaker founders built the College on the premise that all persons have an inner light that must be respected and that each of us can make the world a better place. The Lang Center for Civic and Social Responsibility supports students in these endeavors; they can help connect you with service projects, coordinate a community-based learning component to your academic work, or provide scholarship and grant funding to support a social action project you design. Swarthmore’s idyllic, 425-acre arboretum campus features rolling lawns, a creek, wooded hills, and hiking trails. Graduations have been held in the unique outdoor amphitheater since 1942 (rain or shine). Yet the city of Philadelphia is only half an hour away by the train that stops at the foot of campus. Another benefit of our location is that you can take courses at nearby Haverford and Bryn Mawr Colleges or the University of Pennsylvania. We invite you to investigate all the opportunities Swarthmore has to offer. There’s no substitute for talking with students and discussing your interests with a professor in your major. Our community welcomes the chance to get to know you better. The admission process at Swarthmore is need-blind for US citizens and permanent residents; that is, you are accepted based on your record without reference to your financial situation. Swarthmore meets 100% of determined financial need. More than 55% of our student body receives financial aid awards, which consist of grants (that do not need to be repaid) and include the expectation that students will work a part-time campus-based job. The average financial aid award for the 2017–2018 academic year was $50,361, ranging from $1,000–$69,326.